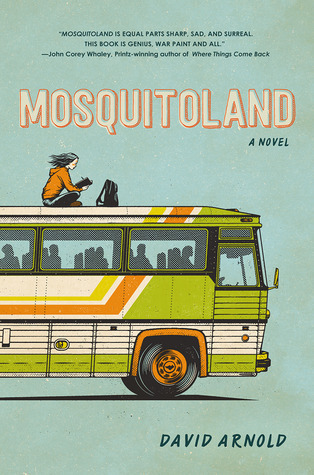 In the coming days I will be participating in the blog tour for MOSQUITOLAND by David Arnold, a 2015 debut I have been anxiously anticipating! But today I wanted to give my readers a sneak peek at the book trailer. There is something so haunting, yet resinating with this music, that causes me to want to know more about this story. Watch below and let me know in the comments what you think. Has this 2015 debut been added to your to-be-read list?! About the book: I am a collection of oddities, a circus of neurons and electrons: my heart is the ringmaster, my soul is the trapeze artist, and the world is my audience. It sounds strange because it is, and it is, because I am strange. Author David Arnold is also the music genius behind Cinema Cycle, that delightful ear goodness heard in the book trailer. To listen to more of his music, visit his website here: http://cinemacycle.bandcamp.com/ & feel free to support this talented artist by purchasing his music, too. I read the sneek peak of this book and it BLEW MY MIND!! !